Former Real Madrid manager Zinedine Zidane has seemingly set a deadline of next June to take over from Jose Mourinho at Manchester United. It is implied by Don Balon that the Frenchman is considering his options after stepping down at the Bernabeu in the summer, with United one of his three main choices. 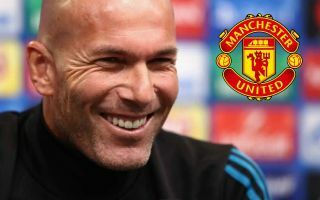 The report states Zidane could replace Mourinho if he is sacked during the season, or if he leaves Old Trafford next June. However, with the three-time Champions League winner also seemingly tempted by potential moves to Paris Saint-Germain or Juventus, according to Don Balon, it seems unlikely United would be able to get him if they leave it any later than that. The report implies in its ordering of the potential jobs that United might be Zidane’s priority, though this is not entirely clear. CaughtOffside have been told by sources close to the 46-year-old that he expects to get an offer to replace Mourinho soon and that he’s even communicated with players at the club about it. Such a successful coach, however, is unlikely to be short of options and it isn’t yet clear if United will part ways with Mourinho any time soon. If MUFC want him, they may only have until next summer at the latest to snap him up before he ends up elsewhere, though of course that will also depend on how Thomas Tuchel does at PSG and Massimiliano Allegri’s situation at Juventus.